The New Mexico state seal identifies government buildings and officials. The symbolism, history and emblems of the seal are described in this article with fast facts. Fact 3: In 1882, Territorial Secretary W.G. Ritch embellished the earlier design with the phrase "Crescit Eundo." The Mexican eagle with the cactus and snake portrays an ancient Aztec myth. 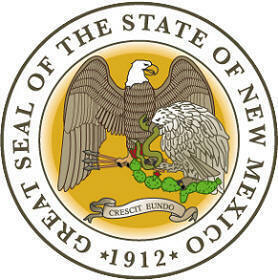 The New Mexico seal is kept and used as required by the Constitution and laws of the state. The Mexican eagle with the cactus and snake portrays an ancient Aztec myth. The main god of the Aztecs promised the people that that they would have a city but had to find a magically special place to build it. To find this special place, they were to look for an eagle, perched on a cactus, holding a snake. For the next 200 years, the Aztecs wandered in the Valley of Mexico until eventually an Aztec priest, standing on the shore of Lake Texcoco saw an eagle, perched on a cactus, with a snake in its mouth. The Aztecs founded their civilization on the island where the eagle was perched. They named the island Tenochtitlan, "the Place of the Prickly Pear Cactus". This early seal of the state highlights the date in Latin numerals of MDCCCL meaning 1850. New Mexico's First Constitution was drafted in May 1850 and claimed the entire Texas Panhandle, plus parts of Utah, Oklahoma, Kansas, Arizona, and Colorado. This resulted in the Congressional Compromise of 1850 that halted the 1850 bid for New Mexico statehood.